this is SO cool!! Thank you so much! I have purchased the RF receiver and transmitter modules, hooked them up and analyzed what the remote control for my sockets puts out (manufacturer is “REV”). It seems to be a pretty versatile system, allowing for up to 16 different sets (A thru P), each controlling up to eight sockets. One day I dropped the remote controller and it never recovered fully from that drop. Particularly the dimming functionality where a button is pressed for a longer period of time does not work too good now. The timing I found is a bit different from yours, the delay is 470µs here, and the pause between two packets is 10 long delays (i.e. 470µs * 10 * 3 = 14.1 ms). I found that each bit seems to repeat. There is only 00 or 11 sequences, no 01 or 10. Only the final 5 low bits are an odd amount. As the remote control has 10 buttons in total, they are using 4 bits to encode each button. Six of the possible combinations are not used at this point. What is funny is that the 4bits for the button (the actual command) are split into two separate parts… resulting in a rather strange sequence. Unfortunately, there are no shops left in the area selling REV products. While I have been anxious to extend the solution, I never dared to buy other sockets because in my experience they tend to be totally incompatible, even though they share the same operating frequency. That would leave me with multiple remote controllers and a lot of confusion every time. I have waited so long for this. Never had the idea of using an RF receiver / transmitter with my sound card to sniff around. You found a great way to make this as simple and easy as can be! It’s David from Hackaday. Can you confirm that this is the way you hooked up the receiver? Yup, that’s the schematic I used to hook up the receiver. What are the resistors between the receiver module and the line out/jack connections for? I’ve been working for a while on a project similar to your proposed weather-station ‘sniffer’. Your experience in decoding the remotes will be useful for that. The resistor values are 39k and 10k. Thanks thuogh I could have worded that better. I was actually after the reason you put them there. Since the circuit was not designed by me, I don’t know the exact reason. But it looks like a simple voltage divider between the data pin and GND, so I assume it’s for scaling down the voltage to match the input range of the sound card. I was about to buy a 433mhz receiver/transmitter module, and then I found out the remote of my sockets operates on 433,4mhz. I’m new to these kind of things (RF). Is there a way to still use that 433 module? The receivers do allow some differences in frequency. So it should be fine. Sorry, I can’t do that. The blog post has all the details for you to work it out yourself. Thanks. I finally got the components for the receiver.. Been working on it for a while, only to find out I don’t have a pc/laptop with a line-in/audio-in. You can try, but I suspect it won’t work for mic-in because that’s un-amplified. If it doesn’t work, you can easily get a PCI sound card, or USB sound card from amazon. I looked this up and it says that you cannot name your sketch MAIN, but my I’ve changed my sketch name multiple times with no luck. Any help is appreciated. The code is supposed to be used with an existing Arduino program that calls the two functions (rf_station_on and rf_station_off) to send signals. You need to provide a setup and loop function as in any Arduino program. Please look at the basics of Arduino programming before using this code. Hi, thank you for sharing your video! I’m trying to simulate the code of remote that opens my house gate/barrier. My original remote has 10dip/switch and sends 12bit (last 2 are always “1”). I follow your guide and the signal that remote and RF trasmitter send are almost identical (up to microseconds), but RF TX doesn’t open the gate! The only diffrences with your guide is that i connect RX signal to inner microphone of my laptop (i don’t have any LINE-IN). However the audacity displayed signals are almost identical, even if the previous noise is only HIGH or LOW without any middle random value. If i use the same timing value for HIGH and LOW for my output pin that i read in audacity, the received signal has different HIGH and LOW timings! Else, if I manually calibrate timings to be identical in received signal to original one, the gate doesn’t open! You mentioned in your “What’s next?” section at the end that you’d be posting a bit on decoding RF from temperature/humidity sensors. 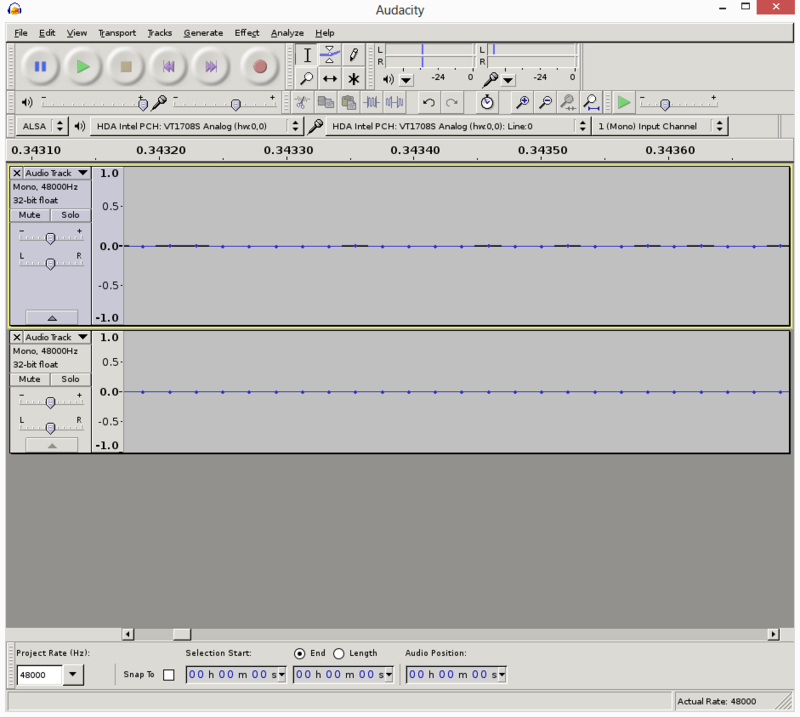 I have an Acurite sensor I’ve managed to decode manually through Audacity, but can’t seem to come up with the right Arduino code to read the data from the 434mhz receiver. Was wondering if you had any plans of posting on this anytime soon, and/or if you had simple example code that could point me in the right direction. Forgot to mention – I have a couple of threads on the Arduino forums that work through the protocol ( http://arduino.cc/forum/index.php/topic,110662.msg840578.html#msg840578 ) and a preliminary sketch ( http://arduino.cc/forum/index.php/topic,112699.0.html ). Would love any insight you have there. Thanks Ray! Hi Josh, good question. I haven’t got time to work on the Arduino code to receive and parse the code yet. Basically my plan is to use a timer interrupt (of 50us or below) to read the value from the RF receiver data pin, and store the signal using run-length encoding. I am really hoping to get this done asap. I was wondering: did any of you have any success on programming the Arduino to receive the code? If not, maybe you can somehow point me in the right direction? I’m trying to get my Arduino to send me a tweet when my wireless doorbell rings. So far, I managed to sniff and re-send the same signal, thanks to Ray’s excellent article. But I don’t have a clue how to program the Arduino to detect the signal. 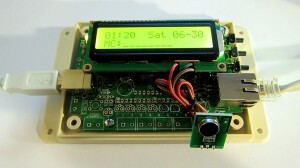 They have examples to use an Arduino to receive and decode the signal. I managed to make it work without the rc-switch library. which is part 4 of a longer series of how I connected my doorbell to Twitter. Just want to say thanks for your code. Saved me a lot of time and work. I interfaced the RF controller to my clipsal alarm system, so when I leave the house and turn my alarm on, it turns my appliances off – saving standby power. The remote that came with my QLD government wireless standby eleminators only has one button, but I discovered it alternated the signal to turn the devices on and off. Can the RF transmitter be connected to a populated OpenSprinkler? I am looking to add RF capability to an OpenSprinkler that I am using as a sprinkler timer as well. Can you give more details about how I would connect the RF transmitter and incorporate the sketch to control the RF transmitter so that it is accessible through the website like the sprinkler valves. Thanks for your help. Hi! Thank’s for this will documented project. I do not own an Arduino, however I would like to try this out with my RaspberryPi. I know that RPi is not well suited for time-critical applications, so before I get necessary parts, have you tried it out yourself? I have not tried it on a Raspi, however, it should be pretty straightforward as long as you can do two thing: 1) toggle digital pin value; 2) control the timing between each two toggles with reasonable accuracy. I believe both can be done on the Raspi. what is ? in that line? That’s ternary operator, pretty standard in C or Java. Hi Ray, I’ve managed to capture the audio from the remote. But little confused as to how you figure out the “1001 0000 0010 1000 00000000000”. I count 25 high points and it happens 8 times when ON is clicked. first 8 bits is the letter, next 8 number and the last 8 command, with an ending 0.
also added the “for” for the number and changed 11 zeros to 1 zero at the end. now when i try to transmit this code. nothing happens. even when i hardcode the bits in index,number and command. Can you please tell what is that LED display you showed in this video? Congratulations for your job! It’s very interesting. But little confused as to how you figure out the “1001 0000 0010 1000 00000000000″. Is possible to explain better how to introduce this code in the arduino example code? My sniffing receiver is 434 MHz, and based on data sheet it shouldn’t really detect 315 MHz. I can line up remote and cloned wave patterns perfectly at 434 MHz so must be something else. However, yes, I haven’t tried sniffing 315 MHz yet, and maybe they are using a broad signal or dual signal. Also, thanks for the link and this entire post! I automated a ton of stuff in my room! this looks pretty neat so I tried to build it but I don’t see anything in audacity but a straight line. I followed the diagram posted above.. did I connect something wrong or maybe I’m not supposed to use a usb to 5v wall connector for power? Is it a perfect straight line, or do you see some noise? Can you try to zoom in and see if there are any details? Also, make sure you’ve plugged the audio cable to the line-in port and that you’ve set audacity to record line-in, not mic. The last bit of tip is that some remote controls work in the 315MHz frequency band. If you are using a 433MHz receiver you won’t be able to detect the signal. but I can’t see a digital signal like in your video, it’s probably too weak? Hi Ray, just wanted to extend a big thank you for this guide. After picking up some similar remote switches, I was able to decode the over-the-air signals on the first try. 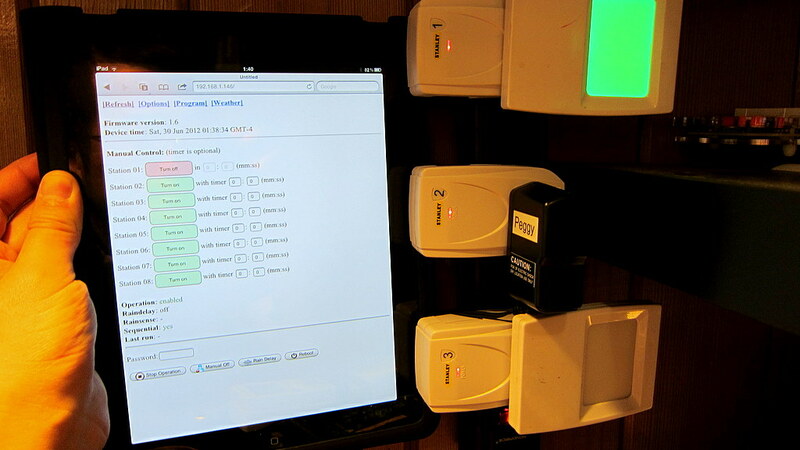 It was a super-cheap and fun way to add appliance on/off and lights on/off to my home automation system. One question – is it possible in your mind to use the 315/434 mhz receivers with an arduino (or other microcontroller) to decode the signals without having to use the the sound card/audacity scheme? It seems the arduino should be fast enough to listen for digital high/low and use timing to determine when real data is detected and discard the rest (noise). I’ve made a couple attempts at it but not much progress. @John G: yes, you should check out the arduino rc-switch library (https://code.google.com/p/rc-switch/), which contains code to automatically decode transmitter patterns of many common rf remotes. No idea why that RC-Switch project never showed up on the many searches I did so thanks very much for the link. The software works great for sniffing and decoding these 315/434 MHz protocols. Should be interesting to see what shows up after it runs for awhile. I have learned a lot from you website! Keep moving forward! Hi! Can you give us some bigger image of the sniffing circuit? I don’t understand what wire to what! thanks! PS great works! great website! I want sniff a sensor temperature. I saw your blog and i would sniff the sensor to try to do as you. I see http://rayshobby.net/wordpress/wp-content/uploads/2012/06/rfsniff_pic.jpg but it’s not easy for me to understand the plan and i don’t find your schematic to make the sniffing circuit. You can precise where i can find the schematic ? the lower right corner, it’s basically two resistors (47K and 10K) connected in series from the receiver’s data pin to GND, plus an audio jack. 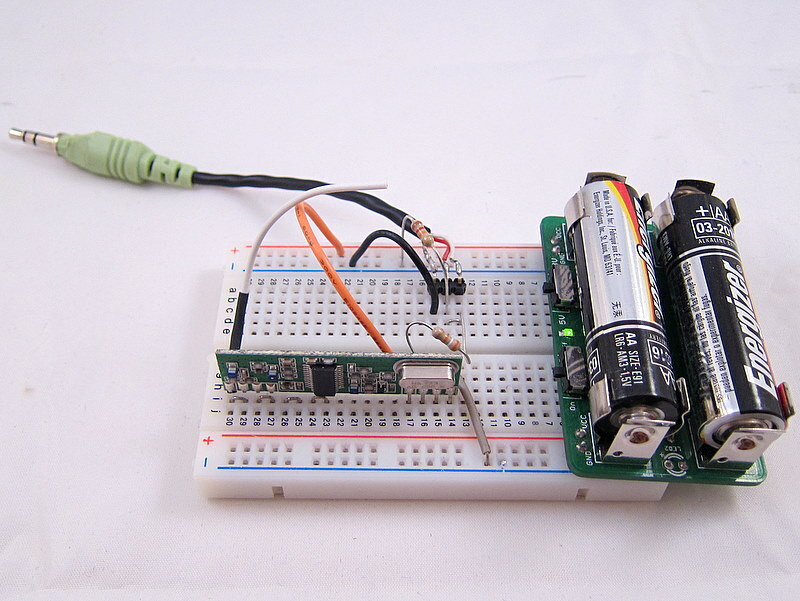 You also need 5V to power the receiver. 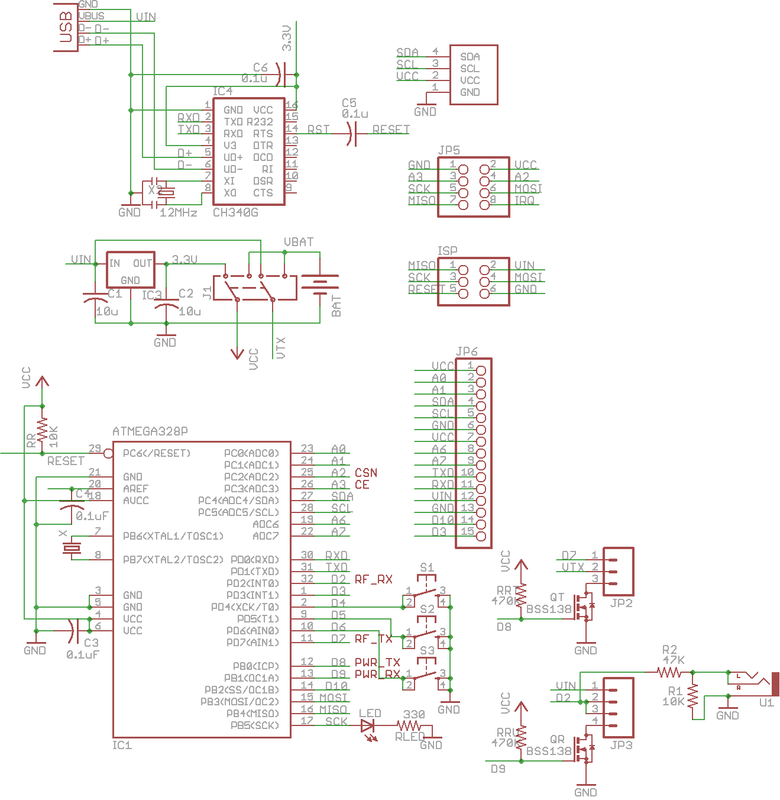 You don’t need the MOSFET as that’s meant for the microcontroller. Mine worked fine. Do pay attention to the power rating: most of these are rated 1000 Watt max, so if you plug in a heater that’s rated 1500 Watt, it may shorten the lifespan of the power socket. Did you get a working example for reading a temperature stat? 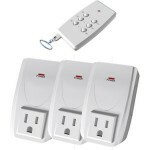 I’m looking to decode some 433-MHz wireless security system sensors I have. It looks like from reading a few of your posts that the code formats are somewhat similar to what I’ve decoded for IR remotes. Am I correct that each ‘1’ bit is a series of 44-kHz pulses and each ‘0’ is the absence of pulses? If so, is that what comes out of a cheap 433-MHz receiver module? The IR modules strip out the 38-kHz carrier and just output a nice TTL-level bit sequence. I don’t do Arduino so I’m looking to see if I can use what I know from my PIC microcontroller expertise and my o-scope to decode the sensors. Security systems (such as car remotes) generally use rolling code so that the same code cannot be used again. Even if you manage to capture one code, it’s not reusable. I doubt that the cheap ebay security sensors/systems use rolling codes. What I was actually looking for was a response re: the nature of the encoding. Further research leads me to believe that it is likely OOK which means that my method for decoding IR signals should work. I will test that theory out whenever I get the RF receiver boards. Got the RF module (RXB6) and confirmed my theory using my oscilloscope. The cheap ebay security sensors do OOK/ASK encoding and output three data bytes with a 9ms low-level sync up front and 1 stop bit. No rolling code. The period for each bit is the same – just the duty cycle varies. That’s different from IR codes, so that’s a minor tweak to my software. Should also be simple to make up my own sensors using the same encoding technique. 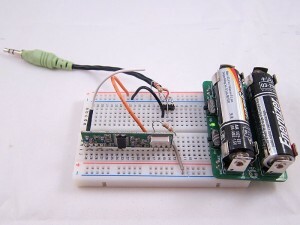 Hey, i am trying to replicate — but i can not find the schematic for the RF sniffer. At the forum link provided i couldn’t find any? Please let me know if you have a copy of it. Thanks for this! I copied the circuit. At first the waveform was totally full of noise so I switched to the linear out pin instead of digital out and then I had a good result. I don’t really understand what the difference is with the pins. I guess data output is to read values as a high or low from arduino or something yeah? The only other challenge I had is I didn’t know which wire was which on the headphone jack, but checked with voltmeter then just used the R and GND lines only. This sure beats risking it by wiring relays to main power. Would it be possible to send the recorded signal using an aux cable connected to a transmit module? If so, how would one connect the aux cable to the transmit module? Yes it’s possible. The transmitter module has three pins: 5V, Gnd and Data. Aux cable (mono) has two pins: signal and ground. So other than you have to provide 5V to the transmitter, you just hook up the signal and ground pins of the aux cable to data and gnd pins of the transmitter.